About Map: Map showing where is Ethiopia located in the World. The given Ethiopia location map shows that Ethiopia is located in the eastern part of Africa continent. 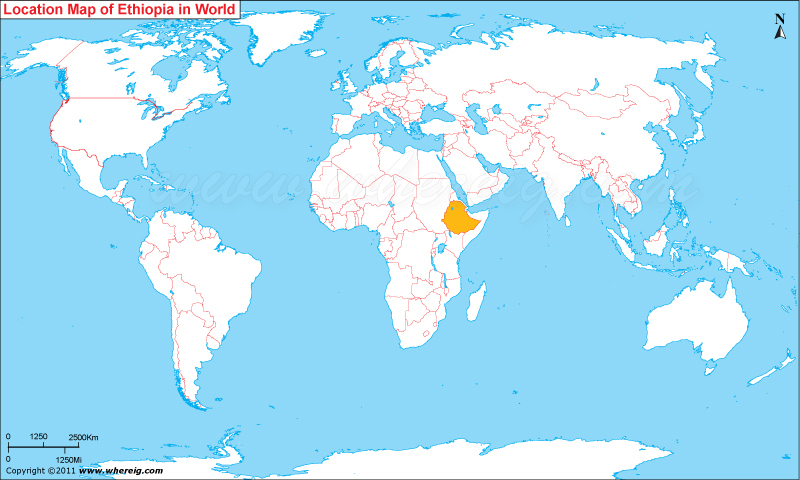 Ethiopia map also shows that the country is located on the Horn of Africa and it shares its international boundaries with Eritrea in the north, Djibouti and Somalia in the east, Kenya in the south, and Sudan in the west. Interestingly, as per some historical evidences, Ethiopia is the ancient site and probably the region of Homo sapiens and from this region, Homo sapience moved towards the Middle East and other places beyond. Not only this, Ethiopia is one of a few African nations, which has its own alphabet. The other interesting facts about the Ethiopia are – Ethiopia has its own time system and distinctive calendar, which is seven to eight years behind the Gregorian Calendar. Above all, Ethiopia has the maximum number of UNESCO World Heritage Sites in Africa. The government type of Ethiopia is a federal parliamentary republic; in this system, the Prime Minister is the head of government. Ethiopia was one of only four African members of the League of Nations. The country of Ethiopia is a land of natural contrasts where number of surprising waterfalls and volcanic hot springs. Furthermore, Ethiopia has some of Africa's highest mountains as well as some lowest points below sea level of the world. The largest cave of Africa is also located in Ethiopia at Sof Omar. Besides, Dallol, which lies in the northernmost area, is one of the hottest places year-round of the world.